Did You Get Your TMI This Morning? 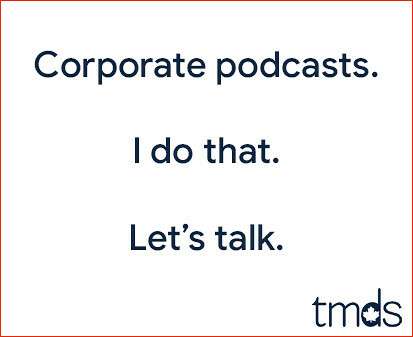 This morning I launched TMI, a weekday morning podcast that promises to be 3-4 minutes in length and deliver five things you should know. Episodes should drop at approximately 8am but they're only available to subscribers. Subscribing is free and easy. Simply visit TorontoMike.com/tmi/ to subscribe in the podcatcher of your choice. If you wish to help crowdfund the project, that's still happening at Patreon.com/torontomike. Already posted on my thoughts on this elsewhere, but I quite enjoyed this new feature!! I enjoyed today's TMI. It is sad to see how the once-mighty Toronto Star has fallen. An extremely challenging advertising market combined with strategic errors, such as not making Star Touch compatible with smart phones, has pushed the newspaper to the brink. However, its nice to see some retro 80s bands receiving some love on your podcasts. The song you played by The Cure, in my opinion, is a classic. I also enjoyed your discussion with Colleen Rusholme about New Order on your KOTJ podcast last week. Very good first show. I like it. Short and to the point. That sounded like Vince McMahon, not Mark Hebscher. Good quick listen! Good to hear comments about everything other than Cheryl's 1st posting every morning. Look forward to future TMI's. song's lyrics will strongly resonate. Every time there's a mass shooting down there I hear that song in my head. and then there are at least a half dozen AC/DC songs on the subject. I hope you stick to the 3-4 minute length as a hard and fast rule because there's no fat on these episodes you get right to the point of the Top 5 stories. This is a great idea. The short length will definitely allow for a daily listen. 40 years ago for sure! Keep up the great work! !